Question 1 Define the term vibration? Question 2 How is simple pendulum made? Question 3 What is the relation between time period and frequency of an oscillating body? Question 4 Name 3 characteristics which are used to describe oscillations? Question 5 Define the term amplitude? Question 6 How can we increase the amplitude of vibration? Question 7 How can we decrease the amplitude of vibration? Question 8 Define the term time period of vibration? Question 9 Define frequency of vibration? Question 10 Define the unit hertz? Question 11 What is the frequency of a vibrating body whose time period is 0.05 sec? Question 12 Calculate the time period of a pendulum which is vibrating with a frequency of 10 hertz? ​A repeated back and forth motion is called vibration. When an object moves back and forth continuously, we say that it is making vibration. When a swing moves back and forth repeatedly, we say that swing is making vibration or oscillation. A simple pendulum can be made by tying about the one metre long thread from a small metal ball and suspending it from a height. The small metal ball of pendulum is called bob .When the pendulum is at rest then its bob is in normal position or central position. If we displays the bob of pendulum to the left side to position B and then release it, it will start vibrating or oscillating like a swing between position B and C. The bob first goes from position B to positions C, and then comes back to B. It again goes from position B to positions C, and then comes back to B. This motion of the pendulum is repeated again and again. 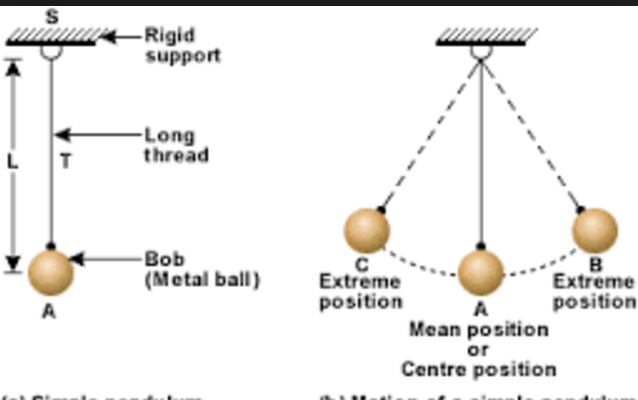 The pendulum bob is vibrating or oscillating between position B and C.
The position A of bob is called Central position and the position B and C are called the extreme position of the bob. When the pendulum bob goes from one extreme position B to the other extreme position C and then comes back to B, it completes 1 vibration or one oscillation . The distance AB is the amplitude of vibration of this simple pendulum. The maximum displacement of a vibrating object from its Central position is called the amplitude of vibration. The amplitude actually tell us how far the vibrating object is displaced from its central position. We can increase the amplitude of vibration of a simple pendulum by raising the height from which the pendulum bob is initially released. We can decrease the amplitude of Vibration by releasing the pendulum bob from a smaller height. One complete to and fro movement of the pendulum bob is called one vibration or one oscillation. The time taken by pendulum bob to complete one vibration or one oscillation is called the time period of pendulum. The time taken by a vibrating object to complete one vibration is called its time period. The time taken by one vibration or oscillation of a simple pendulum is very short and hence cannot be measured accurately. So to find the time taken by 1 vibrations we measure the time taken by a large number of vibration. Dividing the total time by the total number of vibrations we get the time for one vibration of the pendulum. For a given pendulum ,the time period is the same every time. The time period of a pendulum depends only on the length of Pendulum. It does not depend on amplitude of vibrations. The number of vibrations or oscillations made in one second is called the frequency of vibration. The unit of frequency of vibration or oscillation of a vibrating object is hertz. When an object makes one vibration per second its frequency is said to be 1 hertz. If an object makes 10 vibrations per second , then its frequency will be 10 hertz. The frequency actually tells us how fast the vibrating object repeats is motion. We can increase the frequency of a simple pendulum by reducing the length of its thread.And we can decrease the frequency of a simple pendulum by increasing the length. Time period is equal to the reciprocal of frequency.